Here we are, one weekend into a season of migration. Did you make the most of it? Despite the miserable weather, I made a run to Braddock Bay. Though raptors themselves were scarce, I did meet David Brown, this season’s new hawk watcher. The winter resident Northern Shrike also turned up, which was a treat. Corey saw a bunch of birds on a mild Sunday morning though none of them were particularly spectacular. 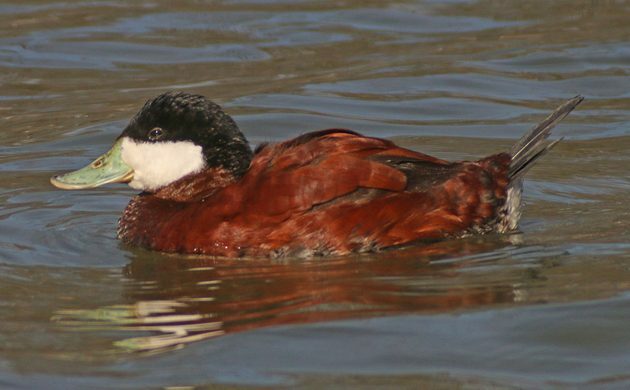 The birds that most caught his eye (and the focus of his digiscoping rig) were some Ruddy Ducks coming into breeding plumage at Brookville Park in Queens. They are his Best Bird of the Weekend. FOY Warbling Vireo outside a bookstore in my corner of northwest Philadellphia! It’s been way too long.